I say this every year and not to be unappreciative of my greatest gift – being a dad, but for me Father’s Day is not about me, but for my Father who left my life 7 years ago. 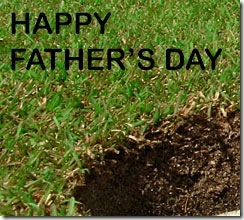 To those of us who had a supportive and close relationship with their Father, you know what I mean. That is what my dad always used to say on Father’s Day when I would ask if there is anything he needed. He said this whether I was 10, 15, 20, or 30 years old. It didn’t matter to him and now I realize that as much as he enjoyed his day, he was honoring his own father and not himself. Well I should say, he did honor himself. He rewarded himself on Fathers Day with a game of golf with his friends. Fathers Day then rewarded my dad with his own Fathers Day memories and to this day they are memories for me. Fathers Day will always be his day. In 1987, my dad let me caddy for him at our local golf course on Father’s Day. Getting up at 7am on a cold foggy morning was my gift to my dad. on hole #17 with the worlds top players just across the street playing the US Open at San Francisco’s Olympic Club, there were no roars, no fist pumps, no new cars awarded as my dad hit his 3rd and last hole-in-one of his life. As I picked the ball out of the hole and gave my dad a big hug and his friends celebrated what would eventually be free drinks back at the clubhouse. All I could say was, “Happy Fathers Day, Dad”. I still remember the smile on his face to this day when he gave me a wink and a simple “Thank You”. I didn’t give him a present, but he gave one to himself. They say golf is a game of generations. For me, Fathers Day will forever be about that day for my dad. I am only glad I was able to share that day with him so that I could relive it every year. Speaking of Tiger parents, I found the quote above and thought it most appropriate for this post given that Tiger Woods was trained by one of the ultimate Tiger parents. Tiger was trained by his own dad and held to high expectations by him. As we all know, he became arguably the best golfer of all time. His father (African American) dominated his life while his quiest Asian mother watched idly from behind the ropes. Now his off the course issues can’t be overlooked. Were his failures the result of being raised by a Tiger parent? As a Tiger parent, you can’t be expected or expect to be able to manage your child forever. This past week I was speaking with a work colleague about our 11 year old sons. He told me how he got upset with his son for speaking on his cell phone, chasing girls and forgetting his studies. How did he handle it? With a belt. He said he teared up that he did it and was shaking afterwards. The joke (myth) I always hear is that Asian people never hit their children and that other cutlures are more apt to physically discipline their child. Whether stereotype or truth, there really is no right way. It depends upon the child. The following is the last of 3 letters that my grandfather gave to me when I told him as a young teen that I wasn’t going to work in his meat company. They were letters that his friend had given to his son who had just graduated from college. Together they reflect what was believed at the time by elderly Asian men to be the proper use of old Far Eastern culture family values and Western culture. These elderly Asian men had nothing and believed that family came first and that sacrifice in the name of family was much more honorable. Please remember this letter is over 30 years old. As your father I welcome you home, and as the President of YYYYYYYYYYYYYYYYY. I welcome you to enter YYYYYYY . I know you have given up your $14,500 job with a very well thought of consulting company and are willing to work with YYYYYY in order to receive the knowledge and experience in management from me. As you know, I started my business when I was only sixteen. I had no friends to help me and no capital to operate the business, but I have built my business in a way as it is today. Furthermore, I have been formally educated for only six years. But I have been learning very hard by myself, and I believe that today, my knowledge in the economy and in politics could be better than what the avearge people possess. As regards to your job, in general parents want to send their children to other companies for receiving the initial training in order for them not t be spoiled. I cannot agree with them in their views. When you work in the big instititutions your job is only limited in the very small area. Your work experience an d knowledge when then be suitable for a limited small area in a big organization like YYYYYYY. I have some experience with some employees of Nihon Schering, who worked with Takedi and Shionogi. These employees had obtained a very little working experience from those big companies, but they had learnd how to criticize the work instead of how to improve the work. As Mr. Takeda told me, in his experience the best employees he had acquired were those who came from Nihon, even they were not the best situation for Nihon. Naturally it was difficult for the father to employ his children in his own company. If the father expects his children to perform a good job, he should make himself a model to show his children. This is not easy. For most fathers in my age want to be relaxed and enjoy their late life, especially when they have enough money to support themselves. But I am still willing to work hard to set an example to show you until you have learned the business. In your case, you are very lucky because you are well-educated, you have the capital from your father, and you have many friends from your own and from your father. I believe you can do hundred times better and be more successful than your father , if you try hard. 4. You should be a model to show to the other employees. I know the above requirements are not easy to perform. But, for your future success, you should try your best to achieve it. I’ve kept these letters for over 32 years. I still find the nuggets in them, but am reminded of the stern nature by which the patriarchs of Asian families ruled their families. You take this back to modern times and there is no way I can parent like this with my own children. While I try to teach my kids the value of the nuclear family and that working hard and striving to be the best that you can be is important, it is no guarantee for success. What everyone keeps asking me though is if this individual and his father ended up okay. Well the truth is that the person these letters were written to eventually became the CEO of his dad’s company and took over as CEO 10 years ago. He is a mulit-millionaire public figure and I would venture to guess that he is more successful than his own father. His two younger brothers are okay financially although they both left their father’s business and received only the value of their trusts. It must be mentioned that the father’s philosophy did have it’s toll on the family. He divorced his wife, and she went back to Asia with their daughter. His old-school treatment of the women in his life could not withstand the pressures of Western culture . This is the last of the 3-letter series of the Asian Tiger dad. I’ve often used this blog to talk about the journey of life. Well this weekend we took a real journey with real paths and real lessons to help a real relationship. There was nothing really wrong with the relationship with my daughter. It just wasn’t as warm as I would have liked it to be. We always talk about “Momma’s Boys” and “Daddy’s Little Girl”. My wife and son definitely have the former but my daughter and I don’t quite have the latter. So we took the opportunity of a Father-Daughter camping retreat with her classmates to a natural preserve near Carmel, CA. Driving south from San Francisco to the Carmel Valley takes an hour and 45 minutes. Our final destination although only 20 miles further through the Santa Lucia Preserve took an additional hour. The winding climb up the mountain was a Tour de France paradise for cyclists. We encounter many through the winding road barely wide enough for 2 cars. Fortunately Herbie (see above) was small enough to deal with the winding switch backs up Robinson Canyon Road. As we left the Carmel Valley, my cell phone(s) went dead. I was now “going dark”. No messages from my wife. It was just me and my seven year old daughter. It was our time to be together and a chance to develop more of that dad and daughter bond. Unfortunately my daughter is not like her older brother. She’s quiet and loves to sleep in the car. The drive was mostly in silence other than my DVD player so it gave me a time to get away from it all. No online media, no clocks, no televisions. The deeper we went into the preserve, the narrower the roads became. I was suddenly overcome by how easy it was to get away and leave the world behind. Just two hours away from one of the major cities in the U.S. I was now dodging chipmunks, squirrels and snakes. I often stopped in the middle of this deserted road for several minutes waiting for another car to come by to confirm the directions, but no cars came along so I ventured forth wondering if I’d ever find the other fathers and their daughters. My daughter woke up from her nap and asked if we were lost. I kidded her that when we are in “Herbie” we are never lost. Part of this trip was to help our daughter realize that her father is equally a parent that she can rely upon. Our relationship is fine by most people’s standards but we don’t spend enough time together to really bond like a father and his son who play golf. She is daddy’s little girl but hanging alone with her dad is tough for her, I can tell. She has often indicated to me how uncomfortable she is driving with me in Herbie. This time she screamed with joy and giggled as we rushed up and down over the hills as Herbie took her for a ride until we reached the Northern edge of the Los Padres National Forest. I’ve always driven my car just to show my kids a fun side to growing up as well as to act a symbol that life is not full of material things such as expensive cars and other luxury items. As I mentioned, my daughter is slightly shy and my goal of this trip was to get her out of her shell and to try to be more adventurous and show her the road less traveled. With her mother’s battle with cancer in the past year, she has shown some hesitancy and cautiousness in life and I wanted to make sure she understood that there are risks in life that you can take without getting hurt. Literally, Herbie and I were taking her on a new adventure to show another side of her father other than the working dad. We finally arrived and pitched the tent and took a look around. Some of the girls who arrived earlier were running around screaming. I finally convinced her to put on her bathing suit and got her to join in a class hike. That jump set the tone for the rest of our weekend as she got brave enough to go down the 200 foot waterslide that she had at first refused to try and later she fished frogs out of the pool with their sliminess in her hands for me to touch. That night in the tent we talked and laughed. For a dad, there is nothing that makes a dad’s heart beat more proudly than to hear his little girl laugh. A close second is when your daughter shows you that she feels comfortable and safe when you are around them. Usually every night I give my daughter a kiss on the cheek as I tuck her into bed. That night out in the valley my daughter gave me the most special hug I’ve ever had. She made me promise that we’d do this again next year. I told her that as long as she had fun and we discovered new things together, we could do this forever. I know this sounds like a simple trip and a simple lesson, but that is what life is all about. Small yet adventurous journeys. The hike was pretty much a successful mission. We hiked a very treacherous path to a waterfall which was freezing cold. I held her hand along the trail which had areas of 100 foot drops and while she was very cautious at first, she eventually started displaying a sense of assuredness with her footing. Still it was good to get some insight into her personality. She wasn’t too adventurous and always exhibited a sense of caution (this is a good note for 10 years from now). At the waterfall she looked at me when one of the other dads jumped off the top. “Should I do it?” I asked her. She looked at me as if I was kidding and that there was no way her daddy would jump 30 feet down into freezing water. This was my chance. When I ripped off my shirt she wrinkled her face as if to say, “You can’t fool me. I’m your daughter and I know you’ll never do it.” As all the little girls cheered for me to jump I could see me daughter with her hands wanting to cover her eyes. The jump was more invigorating than you could imagine. Freezing cold, if I had any circulatory issues, my body is fine now! As I swam across to the rocks where she stood I could see her clapping and cheering with a hug smile. Her daddy was not scared and was pretty brave and very cold. I’m sure the water in Beijing must have been this cold because I broke any records that Michael Phelps had established at the Olympic Games. Later on, once back from the nature hike, I saw my daughter sitting around the outdoor whirlpool with some of the other girls and talking about the “cool dads”. She had a bright smile when one of the girls said I was cool because I jumped off the waterfall. When we eventually returned home the first thing she would tell my wife (although I told her not to) was about dad’s “crazy jump” off a waterfall. Should you want to visit, there are many semi-private grounds in the preserve. Here is the map to get there if you want to take a drive to one of the more peaceful and beautiful places in Northern California. If you are visiting the famous Carmel by the Sea, the Monterey Bay Aquarium or famed Pebble Beach, the preserve is right there. In the end though for me, it was just what my daughter and I needed. I needed to find a daughter who’s love didn’t seem so stiff and awkward. She needed to see a dad who was more fun and able to help her when her mother was not around. Seeing her seek out my hand on the hike along our treacherous hike warmed my heart, but at the same time seeing no worry on her face as she held my hand while danger hung below us was a great metaphor for life with my little girl. I smiled knowing “Daddy’s Little Girl” really did need her dad and we had a weekend that would carry us for a long time. The drive home was still quiet but there was a different vibe as Herbie returned us safely from our little detour in life. A detour that offered a more scenic route for a few days and created a great new rhythm to a relationship between a father and his “daddy’s little girl”.